After I fed the boys their kibble this morning, Micron came up to tell me how much he enjoyed his bowl. Just the right crunch, he says, wagging his plume tail into my coffee mug, absolutely delicious stuff. Then he released a full two-second burp in my face. While holding a dirty sock in his mouth. Ah lovely, thanks so much for sharing that spring blossom with me, Micron. Compliments to the chef and all that. Better out than in, as they say. The boys watching dinner prep like it's a sushi bar or something. 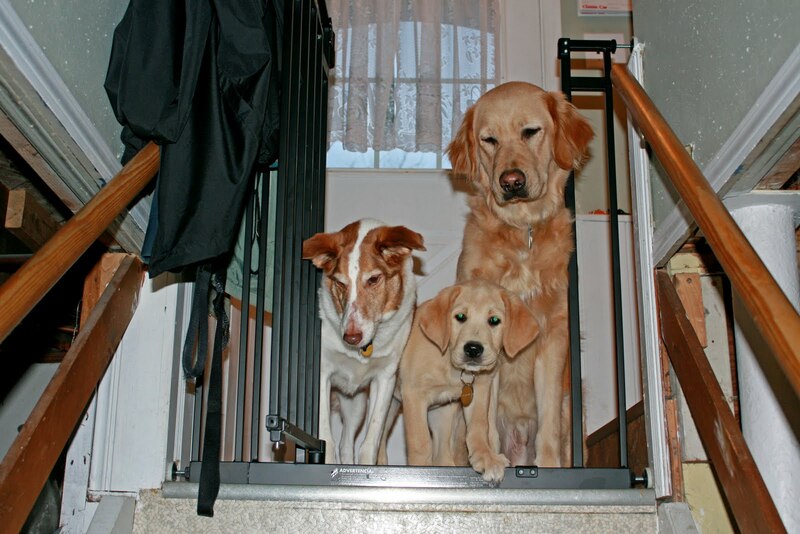 As puppy raisers, CCI tasks us with introducing thirty commands and behaviors to these pups. We work towards proficiency of the basics any well-trained dog would know - sit, down, wait. Then some higher end behaviors like being comfortable walking by the handler's side on either the right or left. And Under, which we use to tell the pup to go under a restaurant table and lie down. 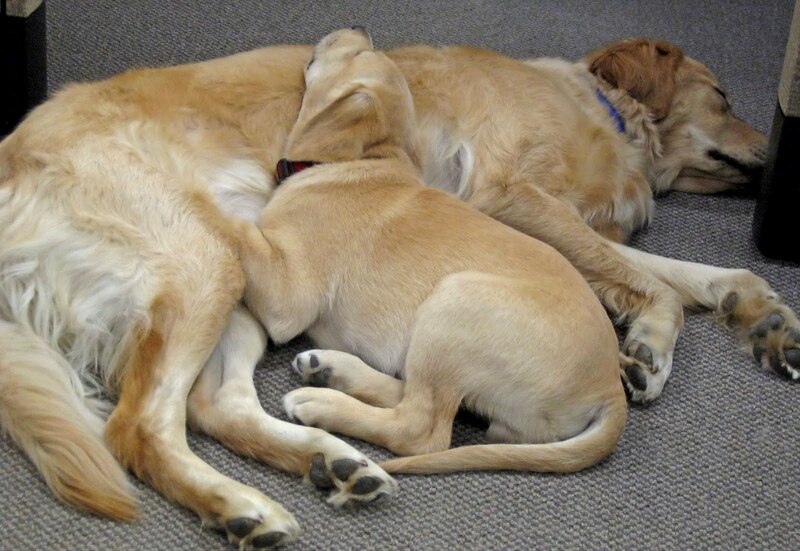 Now these are labs, goldens or a cross between the two breeds. 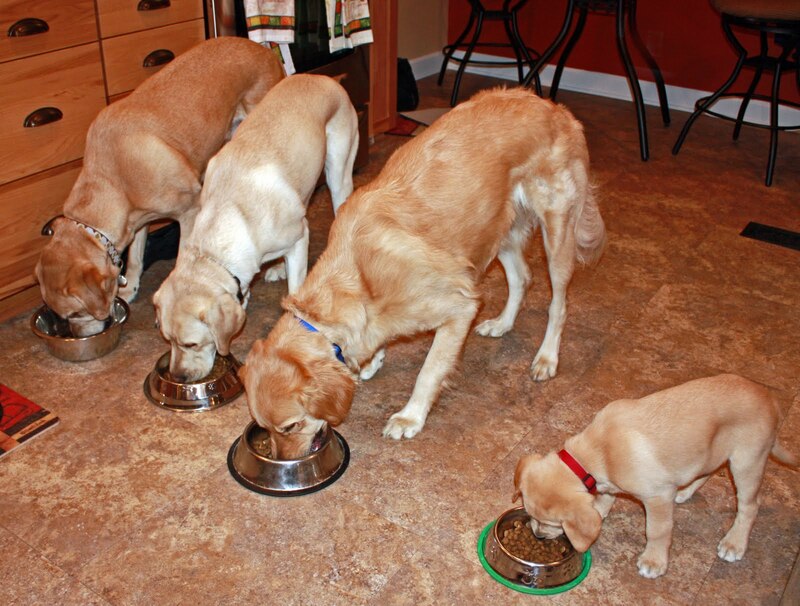 Chow hounds, all of them. (Well, most of them. I've heard of the occasional pup that is a picky eater, but those stories do tend to lean towards the anecdotal.) 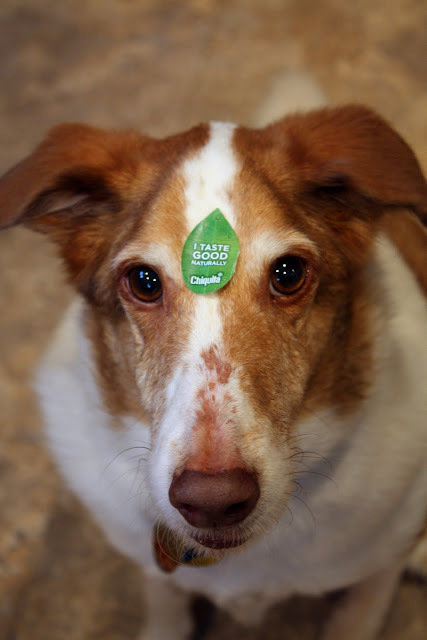 A food motivated dog is a dog that is easy to work with. 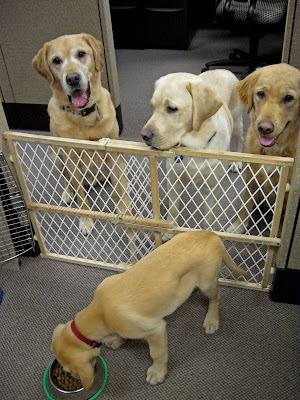 And with kibble eaters like these, you learn behaviors, too. Like spelling out the words hungry and eat while making dinner plans with a fellow human bean. So while we don't really have a command to Eat Kibble, we do ask the dogs to maintain a level of self-control at mealtime. To help prepare them for their service dog careers, it's important that they know how to sit quietly with a full bowl of kibble in front of them and wait for the release command from their handler. Ok, I will admit that in my youth I had no idea this was even possible. Mealtime with the pet dogs involved a quick finger count after the bowl was set on the floor. 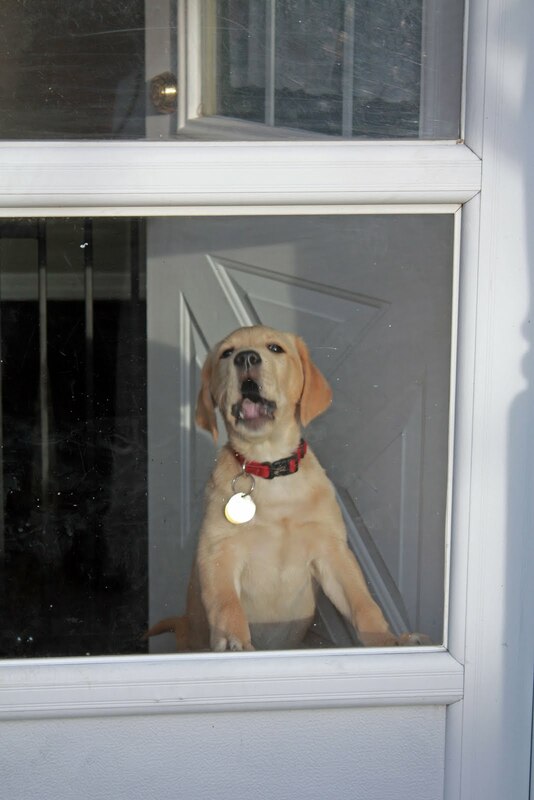 What a difference a Wait command can make. 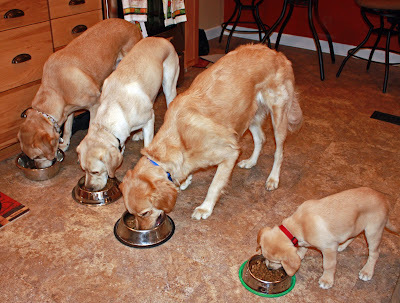 And if you need convincing that dogs can indeed tell time, just put them on a strict feeding schedule. And their doggy circadian rhythm takes over. These boys get fed at seven o'clock in the morning and again at seven o'clock at night. The new guy, Yaxley, gets a noon meal as well, until he gets a little more room in his adorable puppy gut to move the kibble through. Not that that blows the minds of the older dogs or anything. 'Scuse me, Food Lady? I asked for a private table. So indeed, whatever I may be doing in the evenings, I'm never alone. Every room I enter, twelve paws are echoing my steps. These are my bestest buddies. Until chow time, of course. After the kibble goes down the gullet, they're like uncles at Thanksgiving looking for a comfy spot to loosen the belt and take a nap. At a recent CCI presentation, I was asked about any tips for housebreaking a pup. My advice? Portion control feedings on a tight schedule - never free feed. If you know what's going in and when, well then it's just a matter of time until it makes its way on out. 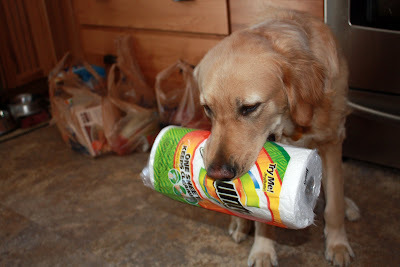 Easy nuff, logically speaking, to forecast your pup's recycling schedule. Hey Food Laaady! It's seven o'clock! It's good to have a household of chow hounds. Never a complaint about what's set in front of them. Always appreciative and more than willing to compliment the chef in their special doggy way. And of course, that's just fine with me. Ya know, the sooner we get these groceries put away, the sooner we can E-A-T. They call me Chicken Legs. Dunno why. Amazing because typical! This can be my personal very first time commenting however I've been subsequent your site for a long time: )#) adore the appearance upon EACH from the felines encounters; )#) extremely adorable hair styles, as well.